I don’t feeeeeeeeeeeeeeeeeeel like posting and being all smarty-pants and intelligent so I’ll do something simple. Like posting about clothes. This is me wearing my beautiful black coat…. And this is me without the coat. 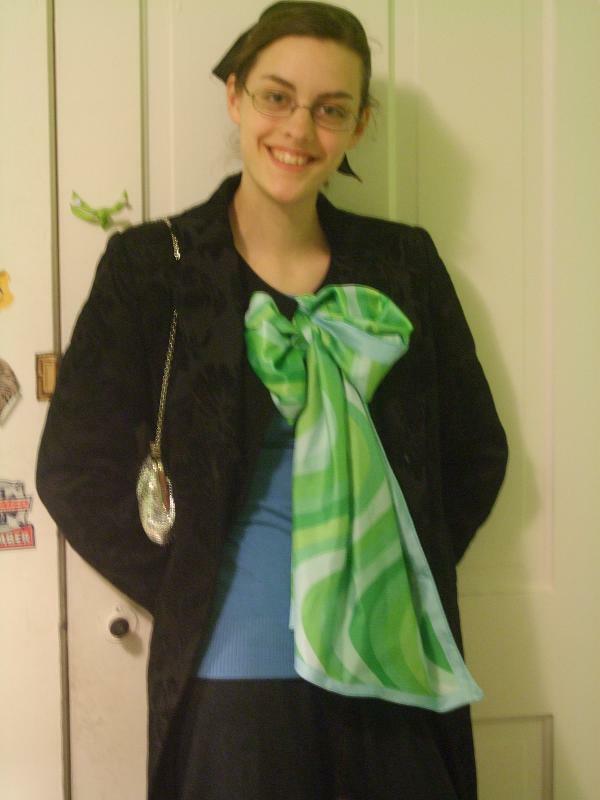 However, in both pictures I am wearing a huge green bow. Story: This evening Ben and I went to JD’s house to plan the entertainment for the upcoming youth fundraiser sweethearts banquet. During the meeting I admitted that I had a secret wish to play the kinect. So JD let me play his kinect. So anyway, I was playing the kinect, and I began to get warm. I had on layered sweaters and a scarf. Finally I got so sick of that scarf around my neck that I tied it in a big bow right where my sweater fastens together. Blue sweater: This is sort of a vest-type thing with a low swooping neck but I turned it around so the neck would be high enough. Amy gave it to me once as a gift. As I was picking off the tag this morning so that I could wear it backwards I noticed that it was from forever21. Hmm. That makes me feel in the affordable fashion loop. The black ribbon sweater was a Christmas present from Mom which she got for peanuts at a garage sale where you could fill a bag for, I think it was $1.50. I modified it to make it fit me since it was way too big. Skirt–Amy gave it to me. She got it because it was a super-comfortable knit which looked like denim, but then it was too tight on her, so she gave it to me. Yay! The long black coat from the first picture I have had for a long time. I don’t even remember when I got it but Mom told me today that it came from a thrift store, brand new with tags still on. There is a hold in the pocket. And it’s missing a button. But no one notices and I get compliments on it all the time. So cool! 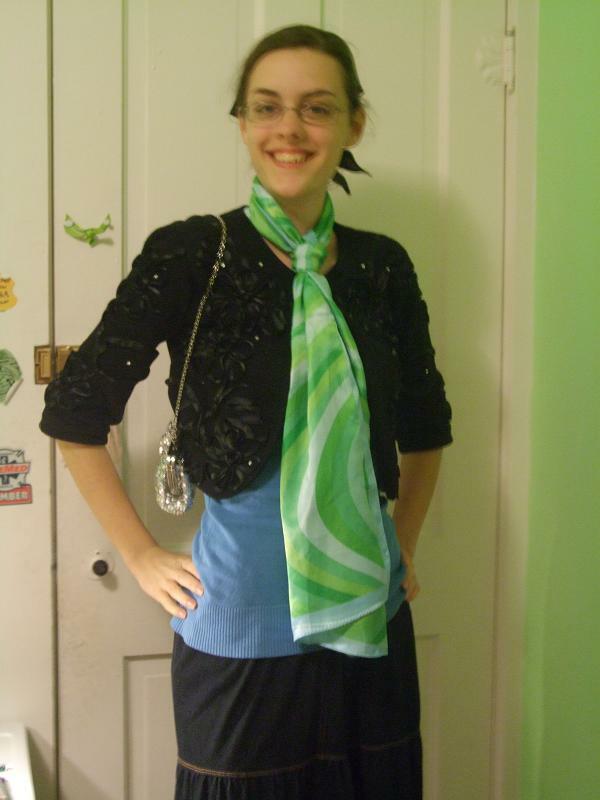 The beautiful BEAUTIFUL green scarf is one of my favorite garments ever. It came from that land-across-the-sea called Yemen, where my uncle went once, and bought me this scarf. 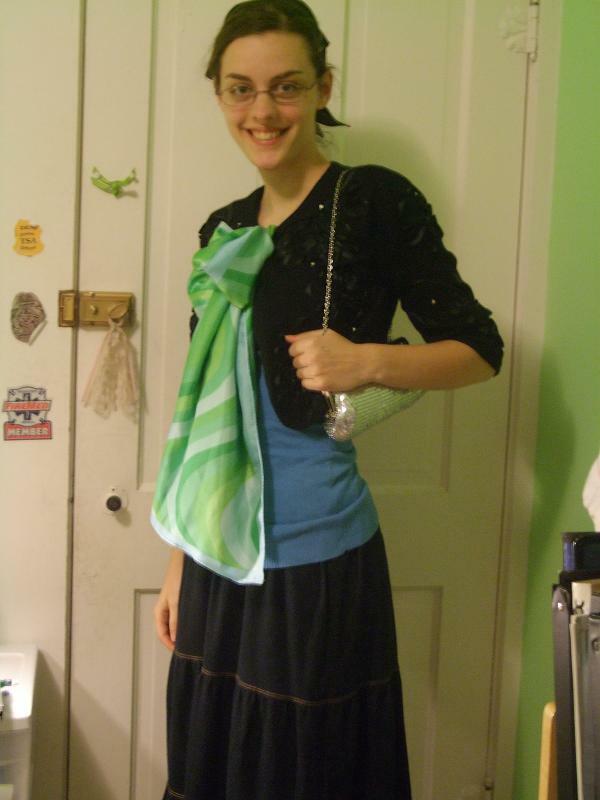 And then…oh yes, I am holding that glittery $18 splurge purse. That makes the total for my outfit come out to…$18. The purse is starting to redeem itself, though, because I take it everywhere, it is just the size of purse I have always wanted, and it makes me happy whenever I look at it. New subject: I was blessed last night. Because there was SOMETHING (cue ominous music) that I could not deal with, and I knew that I had to give it up to God, but how the bunnyslipper do you just MAKE yourself give something to God? Yeah…I do it with mental pictures. The first time, when I gave my sickness to God and completely quit worrying about it, I imagined that I was scraping gum off of the inside of my brain. This time I was shoveling mud out of my brain. I fell asleep then. Contented. I had given it up. It was a nice feeling. Like there is someone above making sure things turn out okay in your life, which I always know is true, but I don’t always feel. It was nice to feel it. I LOVE the mental pictures thing! Ok, so I’m especially glad that someone does things like that besides me! I also appreciate the reminder that this is what I need to do with some things that are bothering me right now, thanks! i didn’t know you wore glasses! OH DEAR. i just figured something out. The email postings stop part way through. Then when you go to the website, there is a bunch more. Now i have to go back and find all the things i missed. Well shucks. 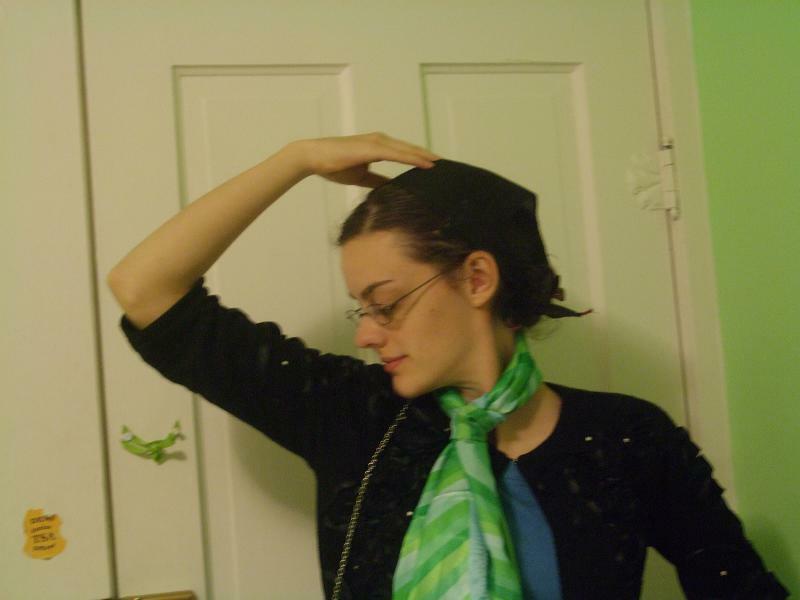 Before i “became” a mennonite, my people wore scarves. They would just be the cotton bandanas for during the week, but for CHURCH, Well, those were fancy, silky, colorful, beautiful. Sometimes i would like to wear them again. i mean, besides the times when i do it to keep the cold wind out of my ears. i’ve never ever heard of that movie before. Do you have it? Maybe we should watch it together. As far as I know, titles can’t be plagiarized, so you shouldn’t worry. P.S. It’s fun to comment after Simone, whom I have loved working with. Hi, Simone! sniff the armpit looks more like twirl myself ballarina but ok…I really wanted to say SOMEONE likes that shade of green! the scarf matches the wall! Hahaha! I think the “sniff the armpit” pictures are hilarious. I’ve been on ClothedMuch’s blog before but don’t read it all that regularly. However, I do read too many modest fashion blogs. 🙂 Here are a few of my favorites. Do you already follow any of the above?